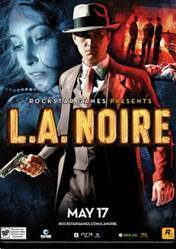 The game takes place in the year 1947 in the city of Los Angeles, a city of glamour, fame, and wealth, but also where crime, vice, and corruption are rife. The player assumes the role of Los Angeles Police Department Officer and later Detective Cole Phelps. The game starts with Phelps as a uniformed patrolman, and follows his career as he advances through the police department bureaus of Traffic, Homicide, Vice and Arson. Instead of missions or levels, the game assigns the player with cases. Each desk gives the player a new partner who will help Phelps in his investigations. After each case, the player will receive a rating of 1-5 stars depending on their performance in both interrogations and searching for clues. When searching an area for clues to the crime, in some cases, players can also find newspapers. Besides reading the story, the newspapers give access to a short cinematic that covers a part of the game's overarching plot or a flashback to Phelps' war memories. Near the end of the final desk, Arson, the player assumes control of Phelps's old Marine comrade Jack Kelso, who becomes the protagonist for the rest of the game; although different in appearance and personality, he controls identically to Phelps. Jeu techniquement très réussit au gameplay original, novateur et très efficace ! Enjoy ! This game is super awezome and great to. Have playd it fully one time now with dlc-s and new stuff started again and gonna play second time over. One of the best police and detective game i have ever seen and playng. Story is great and amazing and different missions and secrets. Recomend this game for house who love investigating and police things. Realistic graphics,interesting story.But it is a little,well, ,,high,, class.Needs good pc to play this.But all in all great game needs a little help sadly but still good. Brilliant detective game. We need more games like this. You are on the good side of the law and solving cases while driving around an old city of angels. The story is well crafted and the expressions of people is still impeccable up to this date. A good game to play with a friend on your side or your significant other.